Teach the children in your class about appropriate and safe scissor use with our Creative Scissors 2 PK. 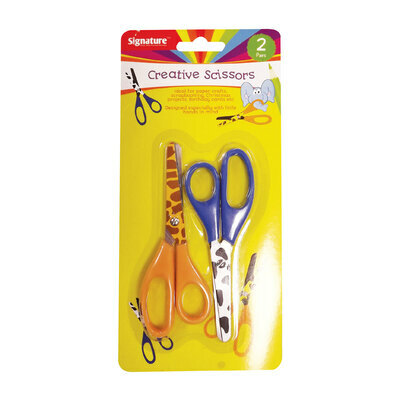 Designed for use by younger children who are just discovering the world of collaging and paper cutting, these bright and vibrant scissors features tiger and zebra prints along the blades to encourage children to practice their new skill. Sturdy and ergonomic handles provide the user with control while cutting and work to reduce the risk of pain or injury during use. The high-quality plastic and metal design are both durable and rustproof, giving you years of exceptional use with every single one of your classes. Partner their new cutting skills with the exciting task of gluing during your next collaging project and ensure you have everything you need from our Glue & Adhesives category. We also stock large value packs of Paper & Card, suitable for all sizes of classroom or activity.